The airlock grommet is a small rubber seal that fits into a hole in the fermenter lid. This will smooth out the drilled hole and provide a clean neat place for the airlock to go in, giving a good airtight seal as the airlock is inserted. 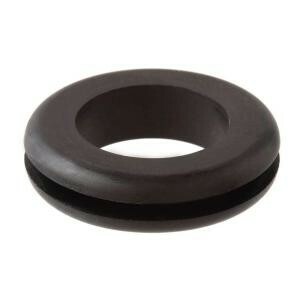 The drill size we recommend for this grommet is 12mm to provide a tight fit. The grommet top and bottom are flared and wider than the hole, allowing the grommet to stay in place in the lid. If you intend to drill a hole in your fermenter lid so that you can insert an airlock, then you need to make sure that the hole is completely round and sealed. The airlock must be tight against the hole in order for the seal to be effective. The grommet will fill any jagged edges or cuts in the lid and provide a perfect hole for the airlock. How do you insert it in the lid? The grommet will need to fit over a 12mm hole that has been drilled into the fermenter lid. Hold the grommet at the sides and gently squeeze so that it makes an oval shape, and push over the hole making sure that the bottom flared part is underneath the lid and the top above. Gently push into the lid all the way around. The last part you will need to push the grommet down at the edge for it to pop into place. The grommet width is for a 12.5mm hole size, so you could also use a 13mm drill hole, but the fitting will not be as tight. We always use a 12mm drill bit and this provides a great seal. When drilling lids, it is best to make sure the lid is supported underneath otherwise it could crack. Use an old scrap piece of wood to drill on to. A flat drill will give a better cut than a standard drill. These drills have a point in the middle and the wide edges are slightly higher with the tips having a cutting edge. Keep the drill on a slow speed for greater control and less chance of any damage.